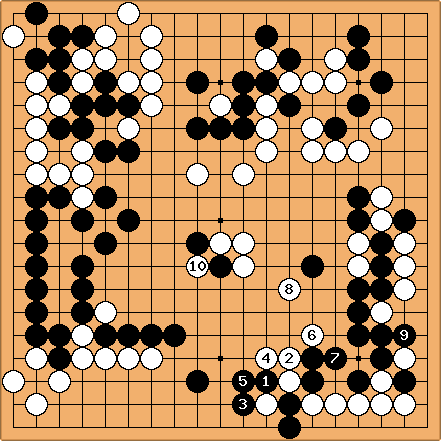 unkx80: The following game between Takagi Shoichi (Black) and Lin Haifeng (White) may be an example. There is no commentary regarding the ko. unkx80: cannot play at , or it will result in White a, Black b, White , resulting in a capturing race that Black cannot win. unkx80: I guess that the aim of starting this ko is to get both and for compensation. unkx80: After the White cut, Black's framework at the bottom vanished in no time. is needed to settle the large dragon. Dieter: As a minor remark, I believe responding to is much better than . 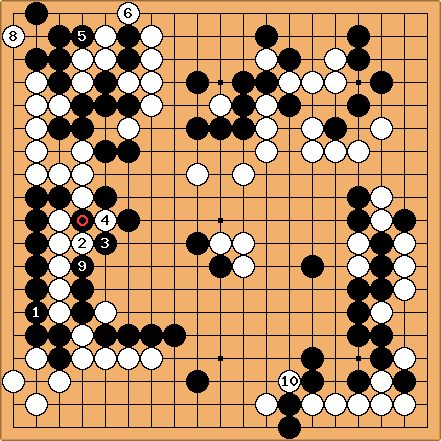 Dieter: In order to understand the strategic concept, we must evaluate what happens if White does not use the ko. Suppose White kills locally, then leaves bad aji, because a now is sente (small reading exercise). Or will be played at b? So I think part of the purpose of the ko was to eliminate the bad aji at the top, by forcing Black to play the threat at (two diagrams ago). unkx80: I don't claim to fully understand this game, but I suspect will be played at b. Then when White cuts at , Black may give up the two stones. 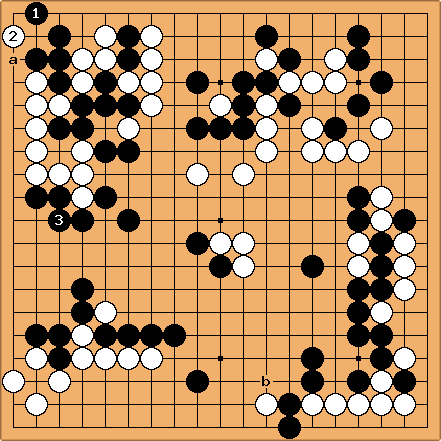 Dieter: I understand the reasoning, but doesn't a clean capture of the upper left, as would happen if Black gives up the 2 stones, simplify the game even more?